Save up to $50 monthly on 3rd Party Services from select WGAN Premium Members, if you are a We Get Around Network (WGAN) Standard or Premium Member. *This vendor offers additional special savings to WGAN Members. Please see WGAN Member Benefits Page. 7. Amount in parentheses ( ) above is limit amount of the BOGO. You may pay more, but the amount that will be reimbursed is $50. 8. If the amount of the buy one service is less than $50, then the amount of the service will be reimbursed. For example, the TriReality Matterport to Video Service is $14.99 each. When you buy two at $14.99 each, the reimbursement will be for $14.99. 11. BOGO handled via rebate via PayPal payment (Member must have a PayPal account to take advantage of this Membership benefit. 12, Participating vendors may change without notice. BOGO requests will be honored for up to 30 days after a vendor is dropped from the program. 14. WGAN reserves the right not to fulfill requests that it feels are either gaming the system or fraudulent. Please allow 10 business days to receive your rebate via PayPal. Not yet a WGAN Standard or Premium Member? 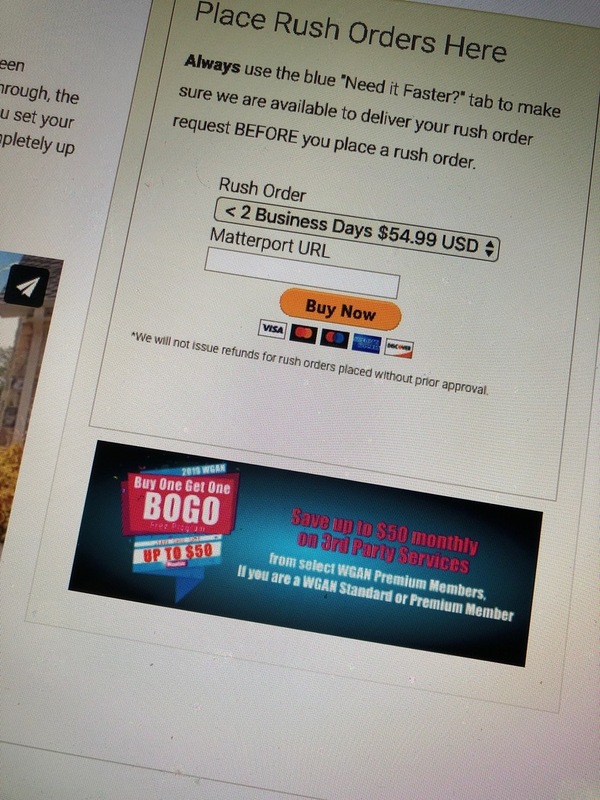 Nice to see TriReality adding the WGAN Bogo Offer to their website for their Matterport to Video Service. A reminder of how you can save money when you buy from WGAN Premium Members.